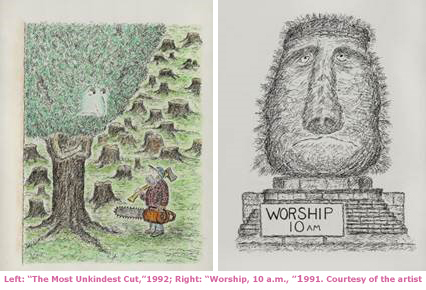 The Syracuse University Art Galleries is exhibiting “Edward Koren: The Capricious Line,” celebrating the five-decade career of renowned cartoonist and long-standing contributor to The New Yorker, Edward Koren. This exhibition presents approximately 50 original works on paper, many displayed for the first time. The show was developed by the Wallach Art Gallery at Columbia University and examines an eclectic set of themes Koren tackles with his wry, astute criticism. Curated by Diane Fane and David Rosand and organized for tour by International Arts & Artists, Washington, D.C., “Edward Koren” is on view through Dec. 23 in the Shaffer Art Building. Gallery hours are Tuesday-Sunday, 11 a.m.-4:30 p.m.; and Thursdays 11 a.m.-8 p.m. The galleries will be closed for university holidays; please visit the website for updated information. With over 1,000 cartoons published in The New Yorker since 1962, Koren’s distinctive style and relatable characters deftly articulate the neurosis of contemporary society. Touching on a diverse set of issues ranging from parenting to man’s relationship to nature, Koren creates succinct scenes that portray man’s awkward rapport to the environment. In contrast to other cartoonists’ aggressively political caricatures, Koren’s decidedly non-confrontational tone uses psychological acuteness and philosophical provocation to elicit laughs and stimulate thought. “The Capricious Line” not only honors the accomplishments of this beloved cartoonist, but also asserts his status as an artist. The full-scale, heavyweight ink drawings that have up until now only been experienced as postcard-sized images in the pages of the New Yorker highlight his mastery of drawing. Koren’s art is all about drawing and the imaginative worlds it can unveil and record. Through this impressive collection of works, Koren shares the sheer fun and joy of drawing with his audiences. These innovative illustrations demonstrate the psychological, philosophical and comical talents of Koren’s pen. Complete information and related programming is available by visiting the website at http://suart.syr.edu/. Born in New York City, Koren attended the Horace Mann School and Columbia University. He did graduate work in etching and engraving with S.W. Hayter at Atelier 17 in Paris, and received an M.F.A. degree from Pratt Institute. Koren pursued his love of cartooning while on the faculty of Brown University for many years. He received a Doctor of Humane Letters Degree from Union College, and was a John Simon Guggenheim Fellow. In 2003, he was appointed Distinguished Visitor at the American Academy in Berlin. In 2007, Koren received the Vermont Governor’s Award for Excellence in the Arts. For over 24 years, he has actively participated in the Brookfield, Vermont, Volunteer Fire Department He lives in Vermont with his family.